Catch the beach at its best, early mornings and evenings. Prepare to hear, "Mom, look!" about 437 times. Gather the gang for a movie or game without running out of seats. Shoulders looking a little too pink? Hide out in the indoor pool for a day or two. Shoo the noisy ones off to the game room while you get a few chapters further in your book. Relax along our 150 feet of private beach. Kids will love the outdoor pool with a lazy river! Enjoy shopping and other activities. A short drive to Daytona International Speedway. 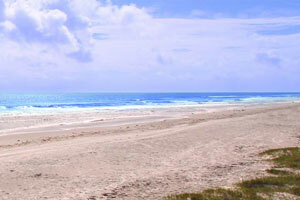 The Cove on Ormond Beach by Diamond Resorts is located just steps from the water. This beachfront resort promises hours of entertainment involving nothing more than sand and surf. Knock yourselves out chasing waves and re-building crushed sand castles even bigger and better than the last ones. The indoor pool has your back if you overdid it in the sun, and the heated outdoor pool with lazy river will keep the goosebumps to a minimum in the cooler winter months. Kids snacking while you’re mid-dinner-making? Subtly suggest they head for the arcade-style game room (you won’t have to ask twice). Studio condos sleep two guests and include a Murphy bed. One- and two-bedroom condos sleep four to six guests. Full kitchens have everything you need to make everyone’s favorites. Head to the Winn Dixie Grocery Store to pick up the essentials – and maybe some not-so-essentials (you are on vacation!) Don’t feel like cooking? No problem! Stonewood Grill & Tavern and IHOP are both across the street. You don’t have to worry about missing the big game or your favorite show, TVs come with premium channels. Up for a family movie night? DVD players have you covered. Bring favorite movies from home, put one of the kids in charge of popcorn duty and another can grab blankets. The last one on the couch is a rotten egg! Gather the shopaholics in your crew and head for Ocean Walk Shoppes & Movies. Best Gift Idea Ever has photography that features letters found in everyday objects. Need a new pair of shades? Head to Sunglass Hut. Point Break has beach apparel. Hungry? Forrest Gump fans will love Bubba Gump’s Shrimp Company. Journey back to the 50’s at Johnny Rockets or enjoy pizza at My Pi. Catch an afternoon flick at Paragon Theater, it has first-run movies. Grownups-only night out? Mai Tai Bar features live music along with one of the best happy hours in Florida. Daytona Lagoon Waterpark has water attractions, laser tag, mini golf, go-karts and a rock wall. Surprise the kids with a visit to Angell & Phelps Chocolate Factory for a delicious treat. Try chocolate-covered Oreos, gummy bears, coffee beans or even bacon! Sugar-free chocolate is available as well. They also have a variety of non-chocolate candy such as Swedish fish, jelly beans and salt water taffy. Customize a box of chocolate to bring home – either as a gift for someone or a souvenir for yourself. Known as the “world center of racing,” Daytona International Speedway has been home to the Daytona 500 since 1959. Check out the new track, completed in early 2016. - Front desk is open 7:00 AM - 11:00 PM daily. Guests that are planning to arrive late must contact the property in advance using information on the booking confirmation to receive check-in instructions. Kids stay free! Children under 17 years old stay free when using existing bedding. Cribs (infant beds) are available for USD 7.00 per night. - Minimum Spring Break check-in age is 21 years old. This property does not allow pets, but service animals are welcome. For more information, please contact the office using the information on the reservation confirmation received after booking. Located to the north of Daytona. Visit the Ormond Beach Scenic Loop Ride for a thirty-mile adventure. The Ormond Beach Sports Complex offers everything from little league baseball fields to shuffleboard courts.